Let’s return to the best of the next filmmakers, the talented up-and-comers who screened their short films at the 52nd New York Film Festival this past October. In our last article, we talked about the challenges that short-film creators can face, especially in terms of financing and distribution. More insight came to us on just how those financial limits can produce burdens such as limited locations and the pool of actors a director can choose from. But our interviews and the panelists’ answers at the Q&A session after the screenings show how inventive filmmakers milk their limits to produce fresh inspiration. At the fillmaker panal first-time filmmaker, but longtime RiverRun International Film Festival director, Andrew Rogers addressed the challenges of getting a short film screened and how the panel members were essentially all lottery winners for getting the chance. Even among quality short films, getting an audience to see them is a shot in the bucket. But Rogers assured us there is hope for the short-film lover! The Internet is throwing the door to distribution platform possibilities wide open.That lottery metaphor made an appearance in our interview with Rogers on the red carpet as well. He pulled out the trusty old comparison to make it clear to his own mother how amazing it was that Crooked Candy was selected for the NYFF. 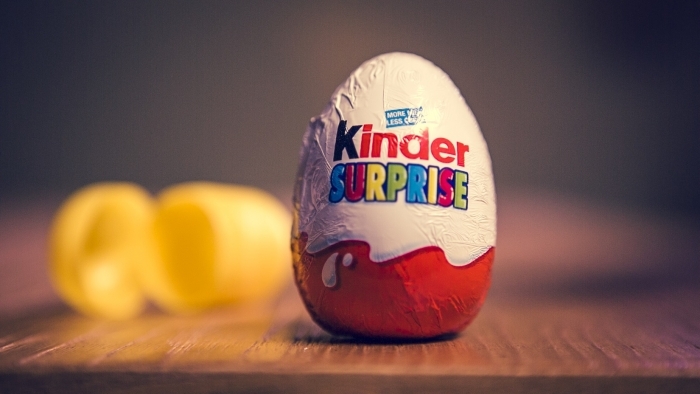 Listen to that explanation and his praise of his four, count ‘em, four whopping crew members who pulled together this impressive documentary on one man’s criminal love for Kinder Eggs. We’re afraid Rogers has inspired our own host to turn to the dark side to hunt down these treats. Tommy Davis is familiar with the financial constraints of short films, which led to him base Hepburn solely in the park from which we learned the film takes its name. Basing the shoot in one location worked out beautifully for setting the atmosphere he wanted. So did the short length—and thus, short costs—of this film that presents a sketch of a crime based on Scott Wolven’s short story “Hammerlock.” Davis had long wanted to dramatize Wolven’s work, but with his past experience being in documentaries, he tapped producer Javier Gonzalez to lend a hand. Gonzalez’s past credits as a production assistant include P.S. I Love You (2007) and Bring It On (2000). Knowing and respecting others’ skills is a gift Davis doesn’t restrict to his producer. During the filmmaker panel, he gave a wonderful testament to the hard work actors put into their performances, witnessing it for the first time through the production of Hepburn. The best directors know a film’s success depends on much more than their own vision. On the red carpet, Yohann Kouam continued the conversation on the importance of casting and why he decided to use completely unknown actors as the faces for his film, the Return, for more than practical concerns. The film is about a teenager and his friends from the projects of France and the pressure the teenager faces when he learns his beloved brother is homosexual. Dealing with real street kids made for some early challenges in filming, but Kouam admitted that their contagious teenage excitement as they became more comfortable with each other almost made filming harder! Casting lesser known actors was also a priority for Marcelo Grabowsky in making Chlorine. He wanted to avoid the big-name stars that everyone back home in Brazil knows. Instead, the filmmaker relied on his past history in casting to use actors who had impressed him on auditions for other work, though they had not ultimately been chosen for those jobs. But unlike Kouam, he didn’t aim for anyone completely unexperienced! Like Davis, Grabowsky also spilled on the red carpet about how limiting Chlorine to one location turned out to be a boon for the film. The sparkling swimming pool lures the audience into a false sense of peacefulness, acting as its own central character. As Film Comment’s Emma Myers writes, the film provides “a dark take on a sexual awakening and witnesses a marriage’s end through the striking green eyes of a wealthy (and perpetually poolside) Brazilian teenager”. Luckily, Grabowsky already has the benefit of a long career as an assistant director, and he beautifully phrased his own identity as an artist as a combination of his vision and the impact of the directors he’s worked under. He’s also partnered with two other young filmmakers whom we’re sure influence each other in their ongoing projects at Mirada Films. Screenings for the Kármán Line have taken our final filmmaker, Oscar Sharp, on the festival circuit of our dreams—and we really want more details about his trip to China. Sharp, unlike Kouam and Grabowsky, did not shy away from casting a well-known British actress as his lead. Olivia Colman brings new meaning to performing with gravitas…considering that her character’s mysterious illness results in the loss of gravity. The concept came to Sharp after watching how a celebrity’s illness boosted her fame, but ultimately, the subject matter became more personal as he related it to his mother’s struggle with leukemia. We’re excited for all the good news about his career that Sharp filled us in on—talk about one short film rising high! In addition to his obvious talent for filmmaking, Sharp already exhibits excellent knowhow for knowing when to keep pounding on doors to secure financing, as he described during the panel. As he described it, filmmakers must find the people who need their story to be told so badly that they’ll finance it. We think producer Javier Gonzalez’s enthusiasm for Hepburn a few clips back confirms what Sharp advised. You heard it here first: true believers speak with their billfolds. The obstacles may be many, but as all the short filmmakers at the NYFF revealed through their words and their films, confronting tight funds can lead to decisions that ultimately elevate the intended story. We can’t help but wonder how much their adaptive capabilities will shine in longer films when they already have so brilliantly in the few brief moments we’ve been given. Hopefully, we’ll find out soon.